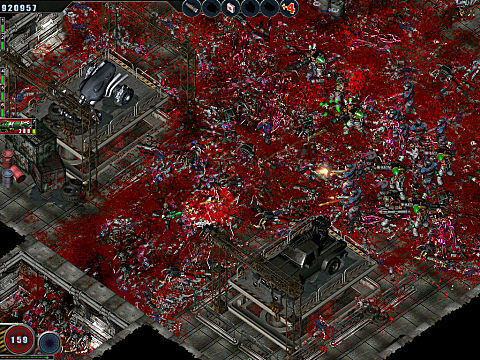 Back in the mid to late 2000’s the zombie phenomenon was starting to make a return in video games. With the success of titles like Dead Rising and Left for Dead, it wasn’t long before other developers wanted a slice of zombie cake. Of course, Sigma-Team couldn’t miss out on the opportunity. 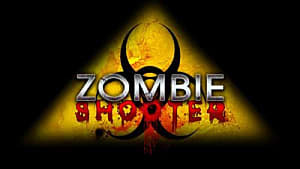 A change from killing tons of aliens to zombies was only natural and Zombie Shooter was born. Zombie Shooter is an isometric shooter developed and published by Russian developer Sigma-Team. It is a spin-off of the company's original title Alien Shooter. 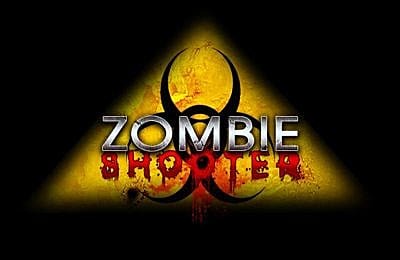 Zombie Shooter released in 2007, and has a few improvements on the original Alien Shooter and is typical fun over the top action. It's rushed development resulted in glitches, bugs, uninspired design and practically reusing the Alien Shooter plot…. Again. As usual with Sigma-Team's games, the plot is secondary and barely exists. Of what little plot there is to be found, it is essentially the same as Alien Shooter. This time, the Magma Corporation decide to create a biologically engineered virus that goes wrong resulting in zombies as opposed to teleportation and aliens. They have gone from being the UCA from DOOM to Umbrella from Resident Evil. After several military assaults fail, you are sent in to investigate. You find that the facility is overrun with zombies and you must stop it. That means slaughter them all. While the plot is almost non-existent and used three times now, it does the job it is designed to. It creates a setting and a reason for the protagonist and zombies to be there. Aside from that, there is nothing else to be found in it. If a good plot is a must, Zombie Shooter isn’t for you. That would be how I would describe the gameplay in four words, as that is 99% of the gameplay. You must make your way through ten levels total, each with an objective that must be completed. At the beginning, you deal with only the most basic of enemies, zombies, zombie dogs, and rats. As you progress through the levels, they become a bit more difficult with new more powerful enemies. As the enemies become more powerful so do you. 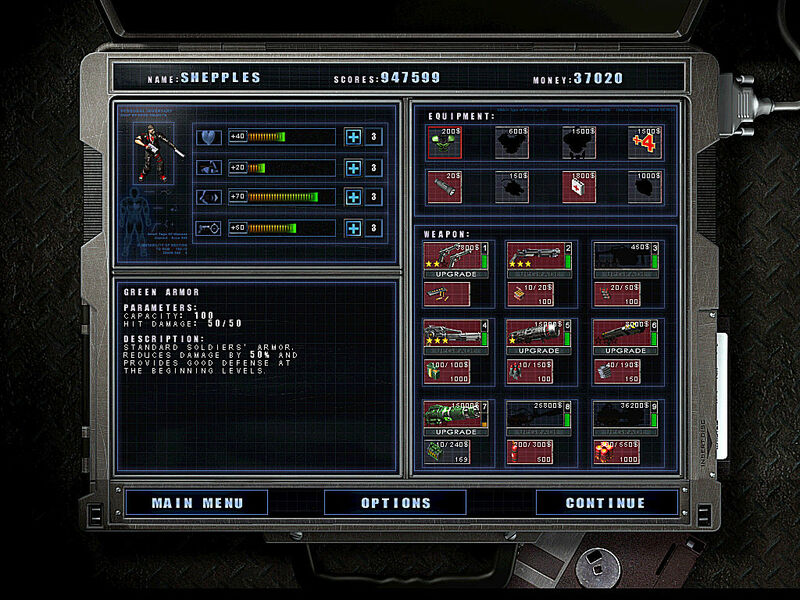 At the beginning of a level, you may buy new equipment, weapons, weapon upgrades, armor and increase your stats. You gain experience for killing enemies. For each level up you gain a stat point you can distribute at the start of the new level. The level up system and weapon upgrades are a nice addition that blends Alien Shooter and it's sequel. Money is obtained from secrets, destructible objects, completing levels and sometimes it is dropped by enemies. Enemies also drop ammunition and health pickups, power-ups such as mega health and temporary invulnerability. Overall the gameplay has only changed in the very slightest in comparison to the original Alien Shooter. As opposed to implants you have the level up system and stats along with weapon upgrades. Then you have the better graphics due to using the Alien Shooter 2 engine to develop the game. 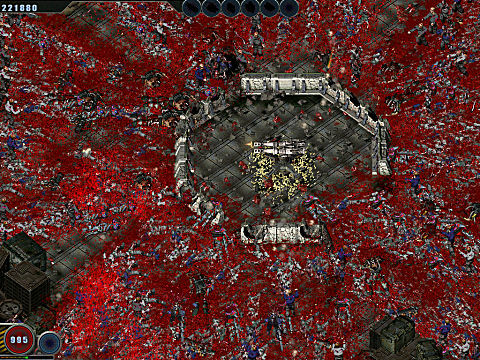 There is no reason to play Zombie Shooter unless you absolutely want nothing more than to shoot tons of zombies. Starting with the weapons, most of them are the same as Alien Shooter but redesigned and slightly adjusted. Some of the weapons fire slightly faster, especially when upgraded and give a bit more of an impact, all of which is welcome. The only new weapon is the disc thrower that replaces Alien Shooter’s Freeze Ray. I really wish they just kept the Freeze Ray as the disc thrower is a rather useless weapon. It’s slow firing and only slices through a few enemies. It’s fine for weak enemies but not the tougher ones you face when you obtain it. Remember I said that Magma Corporation went from being UCA to Umbrella? Well, their enemies also show that transition. If you take a moment to get a good look at them, most are not that different from Resident Evil enemies. You have the standard zombies, zombie dogs, zombie soldiers, two variations of Nemesis and two variations of Uroboros. I wish I was exaggerating, but I am not. The enemies' resemblance to Resident Evil is unmistakable, making them highly uninspired. As for the level design, they are pretty much the same as you would find in Alien Shooter and its sequel. There is nothing new to experience. It is lacking new and original environmental assets that would otherwise separate the levels from previous games. Overall, Zombie Shooter is very much unimaginative. The redesign is welcome but the fact that it only has one new weapon makes its arsenal stale. Anyone who has played the Resident Evil series will immediately see the cringing resemblance in enemies. The level design is nothing more than the same old assets from previous games. If you played Sigma-Team's previous games you will have seen it all before. There are two survival modes in Zombie Shooter. The first is Stand Firm, which is the same as in Alien Shooter and the second is Gun Stand. The idea behind Stand Firm is to survive as long as you can while killing as many zombies and scoring as many points as possible. It starts off quite slowly with only small groups of weaker enemies appearing, but as you progress tougher enemies begin to make an appearance and multiply. At the end of each wave, there is a boss variation of a monster to defeat that will drop a more powerful weapon. Each enemy has a chance of dropping items, upgrades, and power-ups just like in the campaign. While the same as Alien Shooter, it is still quite addictive and fun to play as you attempt to keep bettering your score. 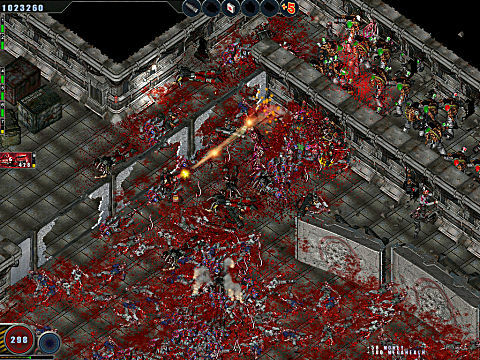 Gun stand is something that was completely new with the release of Zombie Shooter and became a regular addition to later Shooter titles. You control a turret in the middle of a map. Zombies start rushing from all directions. You must survive as long as possible while killing as many zombies as you can. After killing a certain amount of zombies you will be able to set off a nuke, killing any that are near you. While there isn’t much to it, it is still a new addition to the game that is fun and one of its few original aspects. There is no denying that the development of Zombie Shooter was very half-hearted. It released the same year as Alien Shooter 2 and that took four years to develop. The weapons have become rather stale, the enemies uninspired and the levels are nothing more than old design and assets. The only original thing to be found in the game is its soundtrack, which really fits into the zombie theme, and the new survival mode Gun Stand. It feels like it was developed as more of a cash grab while the zombie phenomenon was building and sure enough, it worked. There is a bug where sometimes the game won’t trigger enemies making it impossible to progress and requiring you to restart the level. It is also possible to get stuck in the environment, forcing you to either die or restart the level. 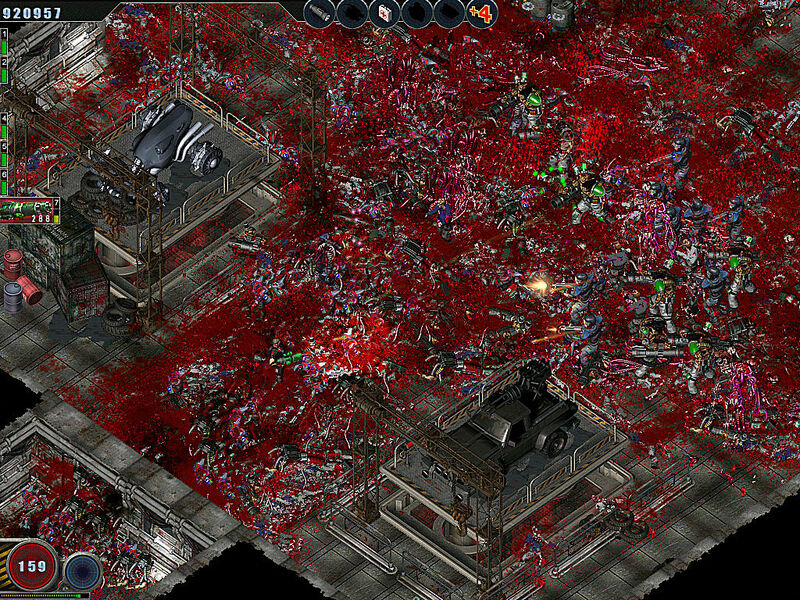 There is fun to be found with the game with its action and massacring tons of zombies. If you look past its very unimaginative design, occasional bugs and play solely for the action, you will have fun. Anyone who enjoyed Alien Shooter will enjoy this. If you don’t like repetition or are looking for more than just Alien Shooter with zombies, I recommend saving your money for another title. Interested in my thoughts of Sigma-Team's Theseus Return of the Hero? You can find my review of in here on GameSkinny. 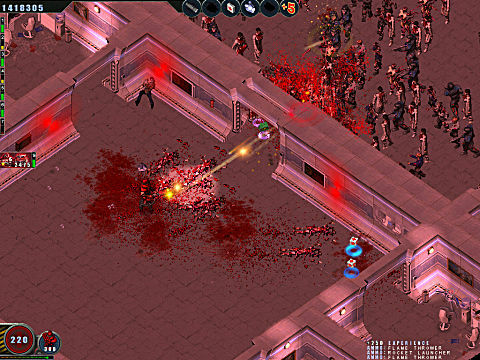 Zombie Shooter is an uninspired spin-off of Alien Shooter that brings little new.